The Right Reverend Bishop Kenneth R. Coward, D. Min. 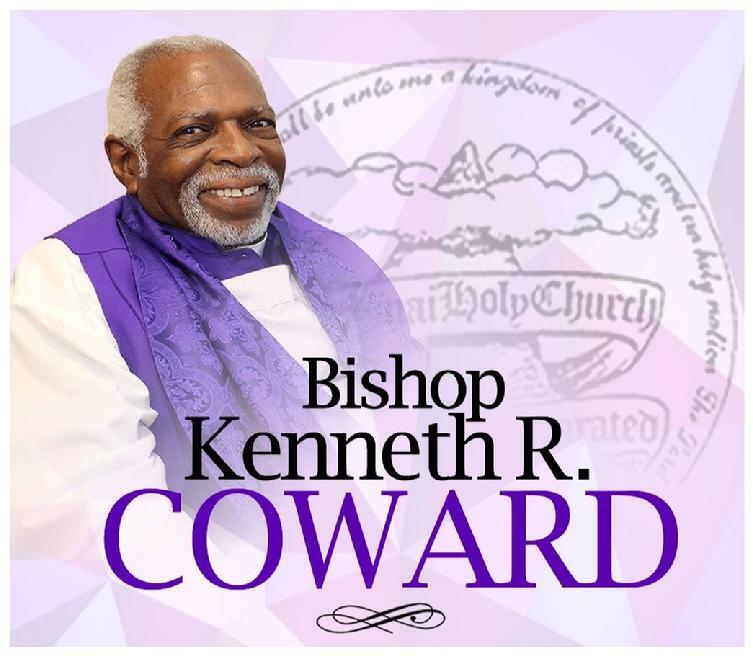 Bishop Kenneth R. Coward was born the second of twelve children to John L. and Rosa L. Coward, July 1, 1948. He was educated in the Richmond, Virginia public school system, completing this phase of his education with a Diploma from Armstrong High School in 1966. He received a full scholarship in Art and attended the Virginia State College in Petersburg, VA. After a year and a half of study, he felt that he had a greater inclination for the sciences and transferred to Virginia Union University where he graduated with top honors with a B.S. in Chemistry. Upon graduating from College he took on a job with Stone & Webster Engineering Corporation where he became the first African American to be hired as a Quality Control Engineer in Nuclear Power Plant Construction. It was while employed here that he was led to continue his education in engineering and completed his engineering degree at Virginia Polytechnic Institute (V.P.I.). Feeling a particular tug on his life to work with people, he took a job teaching chemistry and mathematics at the Bowling Green Junior and Senior High Schools. He is formerly married to Francine Gray from which union he fathered one daughter, Colette Coward, an accomplished musician presently residing in Atlanta, Georgia. Bishop Coward was fortunate to have been raised in a Christian home where all of his life he was introduced to God and was very active in his home church, Jerusalem Holy Church, Richmond, VA. It was there that he received his mentoring and spiritual guidance under the watchful eye of his grandmother and pastor, the late Bishop Annie Chamblin, who challenged him to “stir up the gifts”, which were in him. It was through this inspiration that his musical talent was revealed and he continued to expand his musical interest to playing saxophone, drums, tuba, trombone, trumpet, and clarinet. In 1975 he received a “higher calling” upon his life to enter into the ministry. Reentering College, he finished the Masters of Divinity program at Virginia Union University School of Theology. Later, he enrolled in the Doctor of Ministry program at Union Theological Seminary of Virginia, where he received his Doctorate. For over twenty-five years, Bishop Coward has dedicated his life to serving God through the church. He was pastor of the First Pentecostal Church in Asheboro, North Carolina for seventeen years. Currently, he is the pastor of St. Paul Holy Church in Philadelphia, Pennsylvania. Bishop Coward began a life of dedicated leadership in the Mt. Sinai Holy Church of America in 1975. He was consecrated to the office of Bishop in September 1993. He has served and still serves on numerous boards and committees for the Mt. Sinai Holy Church of America, namely: The Board of Directors, The Council of Bishops, The Board of Presbyters, The Executive Committee, The Education Committee, The Betterment Committee, The Budget and Finance Committee, The Constitution Committee, The Membership Committee, and The Policy Committee. Bishop Coward also served as the Business Administrator for Mt. Sinai from 1991 to present until he was elected as Corporate Secretary for four years. A visionary, Bishop Coward was the Founder and Chief Architect for the Mt. Sinai Training Institute, of which he was also the Director and a Teacher from 1986 to 1991. Bishop Coward also enjoys a well-rounded secular life, as he has served as Chair/President on numerous boards, among them: the Board of Mental Health, United Way and Prison Chaplaincy of North Carolina. He also served as architect of the largest Adult Education programs housed in a non-traditional facility in Richmond, VA. He enjoys the privilege of having private pilots license and motorcycle riding.